“Today was our last play date for the season, and it brought mixed emotions. 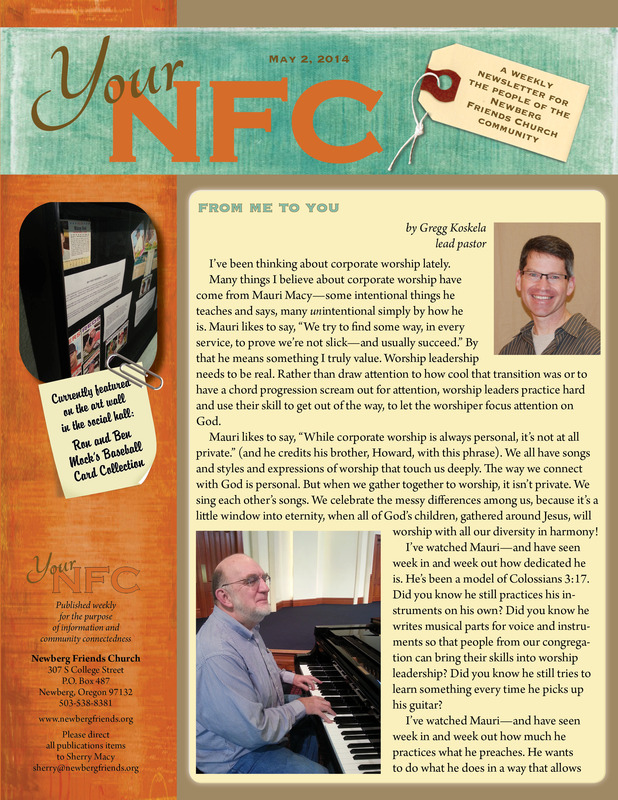 Mauri, our fearless leader, is retiring after 33 years as the NFC worship pastor. At this point we don’t know what the future brings for our little group. As we finished our last song this morning, many of us had tears in our eyes. We know that no matter what happens, our group won’t be the same. Thank you, Mauri, for a wonderful 16 years full of friendship, laughs, tears, ‘roadmaps,’ your ‘two stories,’ a lot of patience, and your music leadership. The bell choir started ringing 25 years ago. Only Mauri and one other ringer were part of the original group. These current ringers exhibit absolute dedication to and love for the whole. With handbells, every player counts! Next Sunday the worship ensemble (a.k.a. choir) will have our season finale, and we will no doubt be thinking about its significance in the same way. It’s a little unusual to anticipate sadness, but it has pre-dawned on me that after my 20 years of singing with this group, I’ll be closing out my own public singing years. No, wait—I’m singing a duet with Quinn at Taylor’s wedding in a couple of weeks. Maybe that other thing I said might not be true after all. But this post isn’t about me; it’s about Mauri. So before you leave, maybe you’d take a minute or two to read what was published in a recent church newsletter. This entry was posted in in the neighborhood, nostalgia. Bookmark the permalink. 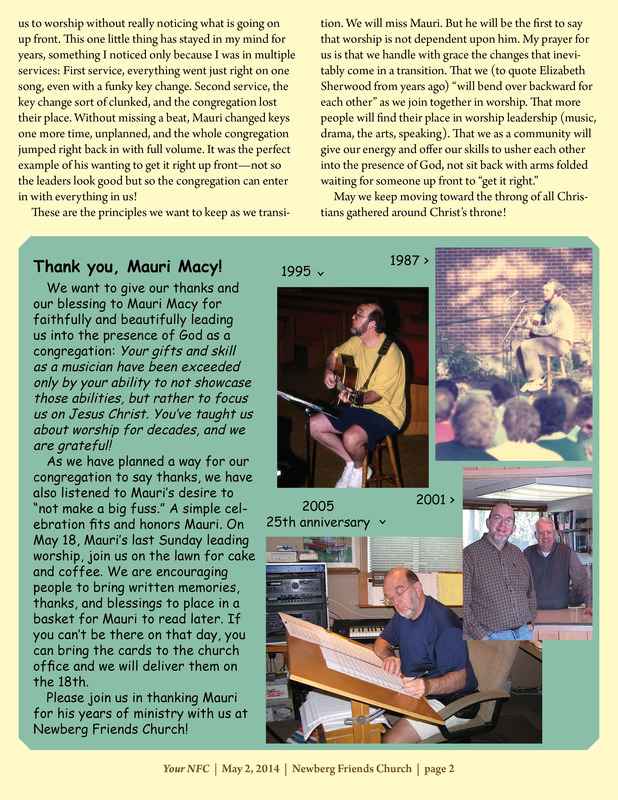 We very much regret missing all these “lasts.” Mauri and you have been such a huge part of our love of worship at NFC. Please know you are much in our thoughts and prayers as you transition. We carry you in our hearts! Thanks, Jo. We feel your absence as well. Wow, 33 years, where does the time go? Having experienced worship with Mauri and you at both The Firs and NFC, I can attest that he has always managed to bring us into that place that “passes all understanding” as we practiced the presence of God together. Mauri has always demonstrated the ability to judiciously navigate the balance between “heart” and “excellence,” between “confidence” and “humility,” between “leadership” and “servanthood,” between “art” and “spirit.” Mauri always points to Christ as the object of our worship. Yet it never seems to be an “intellectual philosophy.” Rather, Mauri leads with gentleness, genuineness, and an appropriate touch of humor that is compelling, engaging, and authentic. I am confident NFC will find it an impossible challenge to fill Mauri’s shoes. I do not envy his “successor.” However, I am also certain that Mauri has no desire to be praised, or lauded, but would prefer people to continue to make Christ the One whom we worship, both corporately and privately. Thank you, friend, for you faithful efforts. Thank you for never seeking glory. Thank you for your (likely unintentional) mentorship. This means so much to both of us. Thank you.